Teachers union members in the Los Angeles Unified School District walked off the job Monday in their first strike since 1989 — a work stoppage that has disrupted the lives of roughly 480,000 public school students and their parents. After three days on rainy picket lines — and five days after last sitting down to talk — UTLA negotiators said late Wednesday that they were ready to go back to the table. "We believe the district will bargain tomorrow," United Teachers Los Angeles Preside Alex Caputo-Pearl said, adding that negotiations are likely to proceed through the weekend. Shortly after Caputo-Pearl spoke came official word that talks were back on for noon at L.A. City Hall, with Mayor Eric Garcetti's office facilitating. Top UTLA and LAUSD officials had last met on Friday, Jan. 11, to try to hammer out a last-minute deal. Initially, both Caputo-Pearl and district superintendent Austin Beutner said they'd meet through last weekend if those talks fell short. That didn't happen. Contract talks first stalled back in July after about a year and a half of negotiations. Then in September, an overwhelming majority of UTLA's rank-and-file approved a strike during a union-wide vote. Almost every day since, the already tattered relationship between UTLA leaders — who represent more than 30,000 teachers, librarians, nurses, social workers and counselors — and LAUSD leadership has frayed a little more. The union has since accused LAUSD of failing to respond substantively to what it believes are crucial bargaining demands. For its part, the district believes UTLA leaders have had their sights set on a strike from the beginning. WHAT HAPPENS NOW? DO I STILL SEND MY KID TO SCHOOL? Schools will remain open — for the same hours, serving the same school meals, offering the same morning and after-school programs. According to this district FAQ, students will even receive instruction during a strike from "qualified L.A. Unified staff," including more than 2,000 administrators pulled from central office jobs. Another 400 non-union substitutes, at least, will be on-hand. But while the FAQ reiterates that students "are expected to attend school every day" — even in the event of a strike — district leaders also fear attendance will plummet if teachers walk off the job. In the first days of the strike, attendance was far lower than normal. ATTENDANCE: 141,631 students attended #lausd schools on Day 1 of the @UTLAnow strike, @LASchools announced. Among the reasons fewer students showed up: some LAUSD parents kept their children home as a show of solidarity with the striking union, saying they wouldn't want to send their children to school across UTLA picket lines. Others may be keeping their children home because of uncertainty about who will be supervising the students. Also: while K-12 services will continue in some form, many early childhood education programs will be interrupted. LAUSD's Early Education Centers and state-run pre-K programs will not be open for the duration of the strike. However, children enrolled in the Preschool Collaborative Program, however — which serves students with special needs — may attend classes from 8 a.m. to 12:30 p.m.
WHY IS THIS HAPPENING? WHY ARE UTLA AND LAUSD AT A STALEMATE? LAUSD leaders believe the district is fast running out of money. UTLA leaders believe that's baloney. If there's one thing preventing the two sides from reaching a deal right now, it is this disagreement. Both sides are dug in over several expensive contract items: salaries, class sizes, special education caseloads and staffing levels for counselors, deans and nurses. The district contends accepting the union's proposals — and this is not an exaggeration — would bankrupt LAUSD. 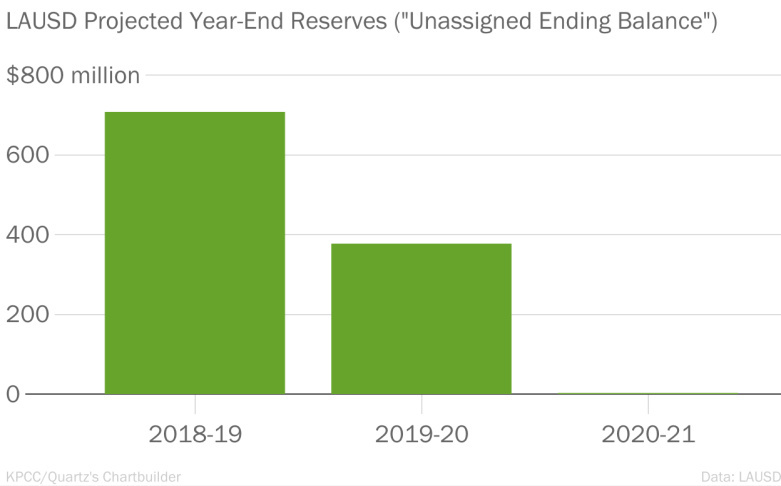 "Simple math," the district's top negotiator wrote in a July 26 letter, "shows that [the district's] reserves would be exhausted this school year should L.A. Unified accept your 'final offer.'" But UTLA contends exactly the opposite: that the district could afford its demands but is exaggerating its current level of fiscal calamity to get the union to accept a cheaper deal. To be sure, there are contract items that are controversial for reasons other than cost. But even if the two sides resolved those non-costly items, UTLA and LAUSD are still potentially almost $3 billion apart. WHAT ARE THE TEACHERS ASKING FOR THAT COSTS SO MUCH? Higher salaries: UTLA wants a 6.5 percent, across-the-board salary increase — a pay bump that the district estimated would cost more than $189 million per year. LAUSD officials, who initially contended that might be too high a price to pay, have been slowly increasing their salary offer throughout the talks. LAUSD has been offering a 6 percent increase and recently dropped demands to make the salary hike contingent on the district's finances and on teachers completing extra training. But the district still wants new hires should have to put in one or two more years of service to the district in order to become eligible for retirement benefits — it's known as the "Rule of 87," and UTLA leaders don't want to agree to that. Smaller class sizes: Among other changes, the teachers want to remove a provision in the contract that currently lets the district skirt rules on how big classes are allowed to be. The district has been open to this idea, but only if the new contract can include a replacement provision — which union officials happen to believe would make it even easier to raise class sizes. But the union doesn't only want to prevent class sizes from growing; UTLA also wants to make overall class sizes smaller. In the end, both proposals would require LAUSD to increase the number of teachers per student. LAUSD recently proposed spending $130 million on targeted reductions in class sizes in certain grades and schools. UTLA thinks the district can afford to do far more. LAUSD already employs more than 2,000 credentialed teachers in non-teaching roles — so their move into the classroom would be cost-neutral, the union argues. More nurses and librarians: UTLA proposes to hire a full-time nurse for every LAUSD school and a full-time librarian for every middle and high school. School district officials partially addressed this demand as part of its $130 million class size package, which also guaranteed "library services" and a doubling of available nursing services in LAUSD middle schools. County officials recently offered to forward up to $10 million in mental health funding to the school district — enough, district officials say, to provide full-day nursing services at every elementary school. Union leaders don't believe the district's latest offer will ensure nursing services on enough campuses. More counselors, social workers and deans: The union wants the district to hire a raft of new counselors for secondary schools and to provide one restorative justice advisor, dean or social worker for every 500 students in a school. Smaller special education caseloads: Where the district proposes to create a task force to study special education caseloads, the union proposes to reduce the number of students assigned to one special education teacher. For all the attention salaries get, the district estimates the union's demands to reduce class sizes and increase staffing levels are far more expensive: between $500 and $600 million per year. The union disagrees, asserting that all of its proposals to lower class sizes and hire more nurses, librarians and counselors could cost as little as $35 million. According to one district estimate, all of the union's demands would add nearly $1 billion a year to the district's budget. For perspective, LAUSD's total annual budget is just over $8 billion. BUT UTLA SAYS THE DISTRICT HAS $1.9 BILLION IN RESERVE. IS THAT TRUE? Technically speaking, that's true. But the union's statement also leaves the misleading impression that LAUSD is perched atop a $1.9 billion pile of cash and refusing to spend it. In reality, the district already has plans to spend almost all of this money. LAUSD is spending roughly half-a-billion dollars more each year than it's taking in. So district officials say they need to burn through most of this $1.9 billion over the next three years in order to break even. For example, this year, the district set aside roughly $1 billion to cover future expenses — including anticipated salary increases. On this point, it's worth noting: some of this $1.9 billion the district set aside is earmarked for "future salary increases" — essentially, for raises for the teachers and the other unions with which LAUSD negotiated contracts this year. In other words, the district appears to be trying to inject at least a portion of that $1.9 billion directly into negotiations. In an August letter to UTLA leaders, Beutner essentially dangled a deal for teachers at a 6 percent salary increase — which Beutner argues is roughly equivalent to what other unions received. At the end of September, L.A. Unified's board voted to formally offer this "6 percent" increase to UTLA. By the end of October, district officials removed several of the strings attached to its offer — including dropping its demand to make half of the raise contingent on LAUSD's deficit projections. LAUSD OFFICIALS SAY THE DISTRICT IS CURRENTLY RUNNING A DEFICIT. IS THAT TRUE? Again, LAUSD is spending more than it's taking in, officials say. LAUSD's budget is balanced this school year. It's balanced next year. But there is a question mark over whether the district can end the third year, 2020-21, in the black. The district plans to ensure a balanced budget if it nips and tucks about $260 million out of its budget over the next three years — to say nothing of setting aside some of that $1.9 billion. Without those steps, LAUSD projects its budget would sink into the red over the next three years, weighed down by flat state funding and rising costs for pensions. Making matters worse: enrollment in LAUSD is declining — and enrollment basically determines the district's funding. But the union points out the district's budget forecasts have been off — drastically off — before. LAUSD budget officials say these projections haven't come true because the district usually is able to make cuts to prevent the most drastic scenarios before they play out. State lawmakers have also come through in recent years with one-time cash the district has used to help patch holes in its budget. Still, the repeating cycle of warnings that haven't come true fuels UTLA president Alex Caputo-Pearl's belief that, as he said in a recent interview, "there's money there to make movement on these items. We need it for the kids." SO WHAT DO THE TEACHERS WANT THAT WON'T COST AS MUCH? Even if money were no object, the contract talks still might be hung up on other issues. 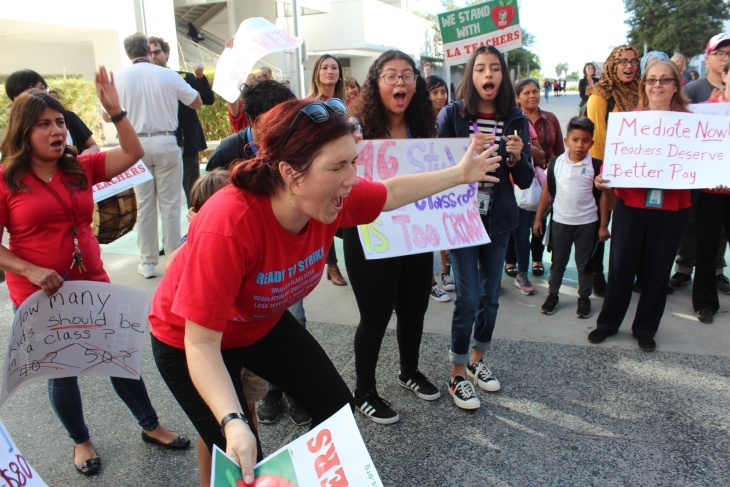 UTLA recently dropped six of its demands that wouldn't have cost as much, but would've significantly changed district regulations on magnet schools, the use of standardized tests and how much power Local School Leadership Councils should have. Evaluation: LAUSD uses a three-tiered evaluation scale for its teachers, and most rank as either "effective" or "meeting expectations." The district wants to add a fourth tier to recognize "highly-effective" teachers. Teachers unions have objected to this for years, seeing it as a gateway to "merit pay" — that is, linking teacher pay with their evaluation rating. Charter school regulation: UTLA wants to create several new regulations that would govern charter schools in the district. Charter schools receive public funds and are regulated by LAUSD, but they operate outside of the district's control and compete with district-run schools for student enrollment and funding. Of particular issue to UTLA are charter school "co-locations" — when charter schools operate on LAUSD-run campuses, as allowed under state law. UTLA's demands call for giving union members on those campuses more authority to ensure "co-locations don't diminish the learning and working conditions at schools." Early education: UTLA wants to change how early education workers are paid and "give them an equitable workday, with lunch break." In March, UTLA officials said the district had refused this demand — and recently said the district hasn't addressed this issue in recent talks. PLEASE TELL ME THIS WILL ALL END SOON. July 2: UTLA declares an "impasse" in its contract talks. That means the union believed no further un-mediated talks with the district would result in a deal. The declaration gets the state's Public Employment Relations Board involved — and it's the first of a series of steps UTLA must take legally before it can strike. July 10: At the state labor board's urging, UTLA walks back its impasse declaration and agrees to return for one final scheduled bargaining session with LAUSD in two weeks. July 24: UTLA lays what it calls its "last, best and final" offer on the table. Two days later, LAUSD's top negotiator says accepting those proposals would "bankrupt" the district. July 27: UTLA declares impasse — again. This time, the Public Employee Relations Board will agree with the union, and begins the process of setting up dates for the two sides to meet with a state-appointed mediator. July 30: UTLA president Alex Caputo-Pearl announces teachers will hold strike authorization votes at the end of August. Aug. 15: Caputo-Pearl — frustrated that the two sides will have to wait for more than a month to meet with a mediator — meets privately with LAUSD superintendent Austin Beutner. The two sides emerge with vastly different accounts of the meeting. Afterward, Beutner releases a letter that seems to outline the parameters of a possible deal. Caputo-Pearl said they never discussed a possible deal in the meeting and called the letter "deceitful." Aug. 23: UTLA kicks off its week-long strike authorization vote. The voting ends Thursday, Aug. 30. Aug. 24: UTLA filed an "unfair labor practice" complaint with the state's Public Employment Relations Commission. They objected to LAUSD's unusually fast reply to a request by some news outfit called KPCC/LAist to see UTLA president Alex Caputo-Pearl's discipline file. It wasn't the request they found galling so much as the timeline for the district's response: UTLA says it has been waiting for, in some cases, up to four months for the district to hand over documents and information relevant to their contract talks. Aug. 28: LAUSD countered with an unfair labor practice charge of its own. The district said UTLA had not seriously engaged during almost a year-and-a-half of talks on a new contract — and even comes close to saying the teachers union has been hoping talks end with a strike from the beginning. The district said UTLA "calculated to time a strike for a period where it can inflict maximum punishment on children and parents so that UTLA may extract financial concessions from the district." LAUSD complains about UTLA's decision to hold a strike vote before the state's mediation process could even begin. Aug. 31: UTLA announces the results of its strike vote and — to almost no one's suprise — the results are overwhelming. Of the roughly 81 percent of UTLA members casting ballots, 98 percent favored authorizing union leadership to call a strike. Sept. 6: In a speech to district principals, Beutner said he did not believe state mediation alone would break the impasse: "I'm open-minded, but I'm not optimistic because we've been at this 18 months and UTLA hasn't changed their list of demands ... It's hard for me to understand how we can go to mediation and say, 'We want you to accept our offer that would bankrupt us.' I don't know how the district can respond constructively to that other than 'no.'" Beutner went on to say he believed contract talks would not likely be solved before the two sides reach the next step of the dispute resolution process: hearing the recommendations of a fact-finder. Sept. 25: L.A. Unified School Board members voted in closed session to boost the district's salary offer to UTLA. Their new offer: a 6 percent raise, split into a 3 percent raise retroactive to July 2017 and another 3 percent raise for the current school year. The current year's raise would be contingent upon teachers performing "extra work and/or training," and if the district's finances are not on solid footing in spring of 2019, the raise would go away next school year. (The district had previously offered 2 percent ongoing and a one-time 2 percent bonus.) The district also promised a limited package of class size reductions. In a statement, UTLA leaders called the offer "insulting". Oct. 4: UTLA leaders released portions of Beutner's official schedule, criticizing the superintendent for holding meetings with prominent charter school supporters including philanthropist Eli Broad. District representatives noted the meetings UTLA highlighted represented a small fraction of Beutner's full calendar. Oct. 12: State mediators released LAUSD and UTLA to fact-finding, the final stage of the state's "impasse resolution procedures." At the end of the weeks-long process, a state-appointed fact-finder will issue non-binding recommendations for resolving the contract dispute. The two sides can use these recommendations as a blueprint for a deal — or they can simply ignore it. Oct. 30: LAUSD officials made a new offer. They again offered a 6 percent raise — 3 percent retroactive, 3 percent ongoing — but drop their request to make part of the raise contingent on the district's finances. LAUSD negotiators also propose to remove a contract provision that allows the district to raise class sizes almost at will — but in its place proposes a new set of conditions under which class sizes could be raised. UTLA leaders said the new conditions are worse than the old provision, telling members "Beutner is trying to buy us off with a raise." Dec. 3: The fact-finder heard arguments from representatives of both LAUSD and UTLA. After the fact-finding presentations, the two sides "agreed to participate in a mediation session, but a settlement was not reached," according to a statement from the union. 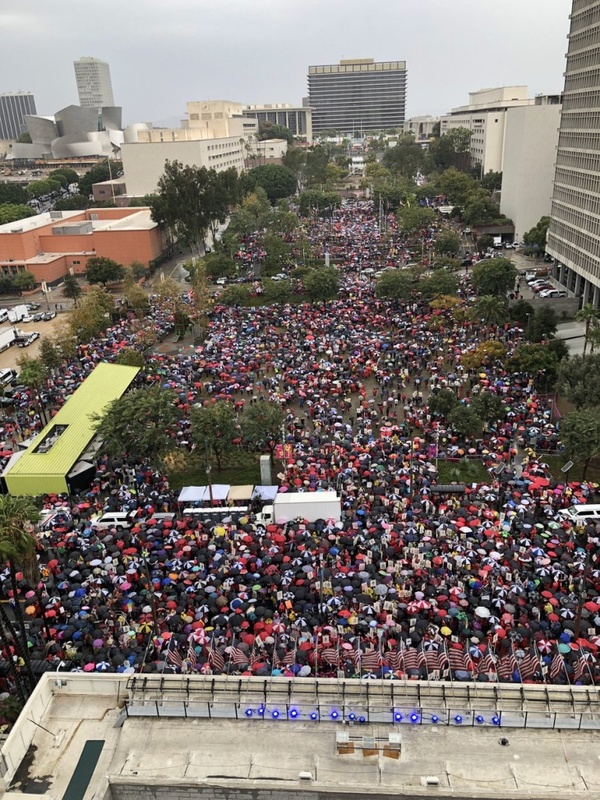 Dec. 15: UTLA convened thousands of supporters for a march through downtown L.A., starting at Grand Park near City Hall. The union ended its march at the Broad Museum — named for philanthropist Eli Broad, who's also a supporter of charter schools and other so-called "education reforms." UTLA's Facebook invite for the event said: "We'll either be celebrating a great bargaining victory if the district meets our demands between now and then, or sending LAUSD and Beutner an irrefutably powerful message that a strike is going to happen if they don't." Dec. 17: Neutral fact-finder David A. Weinberg issued his recommendations for settling the dispute. He pushed UTLA to settle at the district's salary offer: a 6 percent raise. The fact-finder also concluded, despite the financial pressures facing the district, that LAUSD could afford to spend a little more money to lower class sizes and that the two should return to negotiations to hash out the details. But he also urged the two sides to punt on almost all other outstanding contract items, citing them as too complicated, too ambitious or too costly. Dec. 18: LAUSD released the fact-finder's report to the public at a morning press conference. There, Superintendent Austin Beutner touched off a new dispute over whether the two sides had reached a deal on salary. 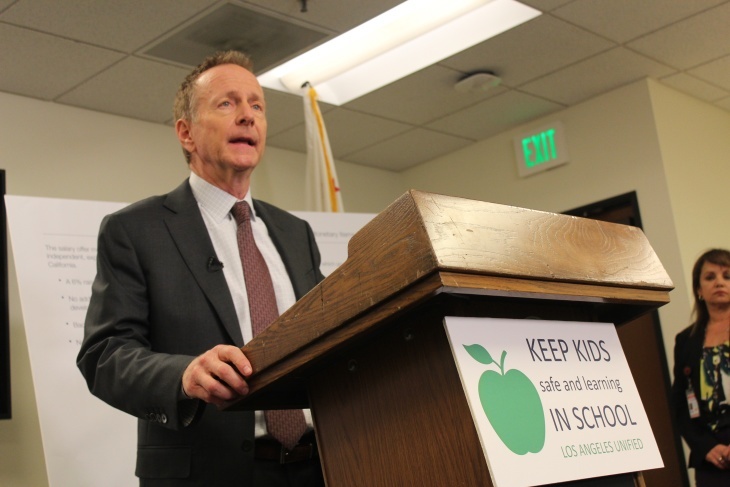 Beutner, an LAUSD press release, and several visual aids at his press conference all claimed the union had "agreed" to the district's proposed 6 percent increase. By that evening, the union had issued a statement asserting that Beutner's claim was misleading. The union has not agreed to a 6 percent raise as a matter of contract negotiations; the union's appointee to the fact-finding panel had merely concurred with the fact-finder's recommendation of accepting the district's salary offer. Behind the scenes, LAUSD negotiators email UTLA leaders suggesting that the two sides resume bargaining. Dec. 19: UTLA leaders announced that they would strike on Jan. 10 if they hadn't reached a deal with the district. 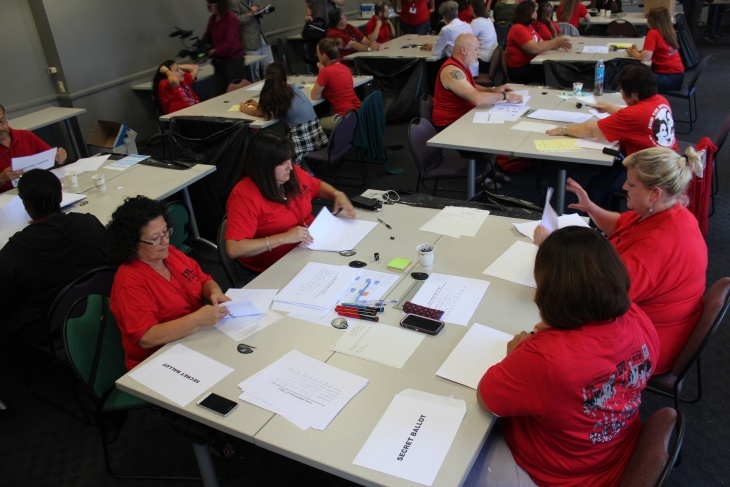 UTLA president Alex Caputo-Pearl said that, in the union's estimation, the district had failed to make serious counter-offers to the union's demands on several issues, including on standardized testing and early childhood education. Caputo-Pearl said UTLA had no plans to return to the bargaining table until the district came forward with an offer that responded to those demands. "The district knows where we are," he said. "We're right down the street from each other." Meanwhile, behind the scenes, union leaders emailed the district saying they felt the fact-finder's recommendations "don't ... serve as a basis for resolving the bargaining dispute between UTLA and LAUSD." Dec. 18-Jan. 2: Without in-person talks underway, union officials and district leaders engage in a dizzying and confusing email back-and-forth. Copies of the emails were ultimately released by the district. The chain began with the head of LAUSD's bargaining team, Rob Samples, e-mailing the union to say the district was essentially folding many of the recommendations in the fact-finder's report as part of its negotiating position. Would that be enough, he asked, to bring the union back to the table? At first, union leaders responded by questioning whether this really constituted the new "offer" — the documents the district sent over were confusing and lacking detail, UTLA said. "Yes," Samples replied on Jan. 2, "this was an offer." UTLA executive director Jeff Good responds by asking the district to "provide a legitimate bargaining proposal that comprehensively addresses the UTLA package of demands." If LAUSD can do this, Good says the union is available to resume talks on Monday, Jan. 7. Jan. 3: UTLA issues a statement announcing they had rejected LAUSD's "so-called offer," but floated the possibility of meeting Monday, Jan. 7. LAUSD jumped at the opening, issuing a statement: "We welcome UTLA's willingness to return to contract negotiations." Jan. 3: LAUSD attorneys asked a federal judge to block UTLA members who serve students with disabilities from striking. The district's special education services have been under court monitoring ever since a 1996 settlement in the Chanda Smith case. LAUSD argued a teacher strike could throw the district out of compliance with that settlement. UTLA called the move "the legal equivalent of a Hail Mary pass," accusing the district of "using our most vulnerable students as pawns." Jan. 4: Behind the scenes, LAUSD negotiator Rob Samples emails in reply to UTLA to confirm a Monday, Jan. 7, meeting would work. Jan. 4: U.S. District Judge Ronald Lew rejected LAUSD's move to block special ed teachers from striking. The judge's ruling turned down LAUSD's request on technical grounds, but left open the door for the district to file a new lawsuit that might block special education teachers from striking. Jan. 6: UTLA releases a statement acknowledging that their members may not be able to begin their strike on Thurs., Jan. 10, as they had initially planned. Union officials said there was a legal disagreement about when and whether UTLA had filed the right paperwork giving formal notice of their intent to strike. Though the union promised to "proactively" go to court in the coming week to ensure its members could still strike on Jan. 10, the union acknowledged the snafu could delay a strike by "a few days" — to Jan. 14. Jan. 7: Negotiators for the two sides meet for the first face-to-face talks since at least Dec. 3. Both UTLA president Alex Caputo-Pearl and LAUSD superintendent Austin Beutner — who had previously left much of the face-to-face negotiation to their bargaining teams — personally joined the talks. Jan. 8: In court, a lawyer for UTLA tells a judge that if there's no clarity by Thursday Jan. 10 about the legality of a strike, he's concerned union members might stage "wildcat strikes" — in other words, unauthorized strike activity. But before the judge can even get to the matter at hand, the case gets hung up on a procedural matter that throws the strike date into question. Jan. 9: UTLA announces it will postpone the strike until Monday, Jan. 14, at the earliest over uncertainty about how a judge would rule on the legality of its strike date. LAUSD announces plans to argue for an even further delay in the strike date. The L.A. County Office of Education appoints a "fiscal expert" to monitor the district's budget. Jan. 10: A judge rules that a the strike can go forward on Monday, Jan. 14. Also, California Gov. Gavin Newsom announces a state budget proposal that, if approved, would include an increase in funding for K-12 education — which means millions more dollars LAUSD could use to meet UTLA's costliest demands. 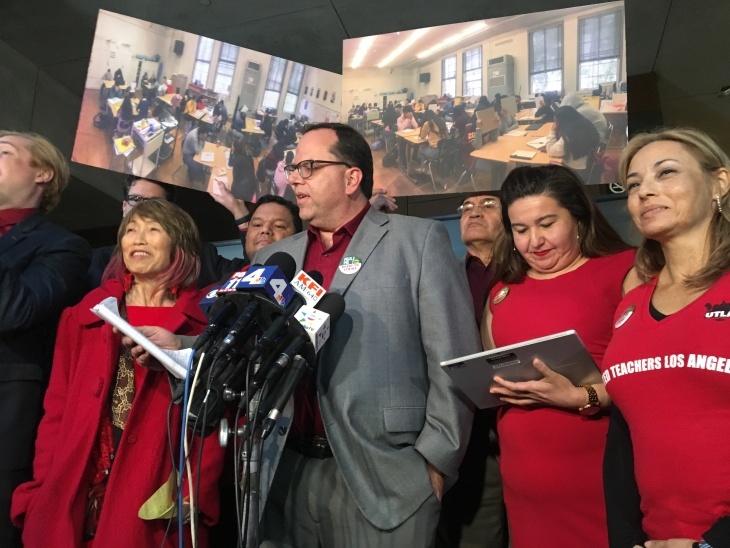 LAUSD officials took the opening: "It is our intention," Superintendent Austin Beutner announced, "to propose a revised offer to UTLA tomorrow" (Fri., Jan. 11), based on the "good news." Jan. 11: UTLA leaders reject LAUSD's latest offer, saying they have no plans to return to talks over the weekend, setting the stage for a strike. Jan. 13: In an interview, Beutner said the two sides did not negotiate over the weekend. A strike is now a certainty. Jan. 14: The first teachers strike in Los Angeles in 30 years is set to begin. Jan. 16: Pro-teacher marchers rally at the private home of LAUSD school board resident Mónica García. UTLA negotiators say they are ready to sit back down to resume contract talks. Talks are confirmed back on for Thursday at City Hall. Jan. 17: Talks between UTLA and LAUSD begin. Principals union leader Juan Flecha sends letter to LAUSD officials suggesting they shut down schools for remainder of the strike. LAUSD Superintendent responds that schools will stay open. Correction, Aug. 30: An earlier version of this post incorrectly said LAUSD was spending "half-a-million" dollars more each year than it was taking in. The district is currently spending roughly $500 million more each year than it's taking in. KPCC/LAist regrets the error. Update & Clarification, Sept. 4: The post was updated with results of the union's strike authorization vote. Additionally, a reference to enhancing the power of "local school site councils" was updated to clarify that UTLA wishes to give more power to "Local School Leadership Councils." Sept. 26: This post was updated to reflect additional events from the last month, including L.A. Unified's revised salary offer of Sept. 25. Oct. 12: This post was updated to reflect additional events from the last month, including the release of Beutner's calendar on Oct. 4. Oct. 15: This post was updated to note the end of state mediation and the beginning of fact-finding. Oct. 17: This post was updated to include the district's FAQ for parents on the district's contingency plan in the event of a strike. Nov. 30: This post was updated to reflect additional events, including the district's Oct. 30 offer and plans to meet with the fact-finder on Dec. 3. Dec. 14: This post was updated to reflect additional events, including the end of fact-finding and the planned march through downtown Los Angeles. Dec. 15: This post was updated with additional information about the next steps in the process. Dec. 26: This post was updated throughout to reflect the release of the fact-finder's report and UTLA's announcement of its strike date. Jan. 7: This post was updated throughout to reflect the new uncertainty about the strike date and Jan. 7 negotiations. Jan. 8: This post was updated to reflect court-filing hiccups by UTLA and ongoing uncertainty about the strike date. Jan. 9: This post was updated with news that UTLA postponed the strike to Jan. 14 at the earliest. Jan. 11: This post was updated to reflect the Jan. 7 offers from both LAUSD and UTLA as well as recent developments with the state budget. Jan. 13: This post was updated to reflect the Jan. 11 offer from LAUSD and other more recent events. Other portions of this post that are now outdated were removed. Jan. 16: This post was updated to reflect the current status of the strike and news that talks were scheduled to resume the next day. Jan. 17: This post was updated to reflect the current status of the strike and news that the principals union asked LAUSD to consider shutting schools for the remainder of the strike.